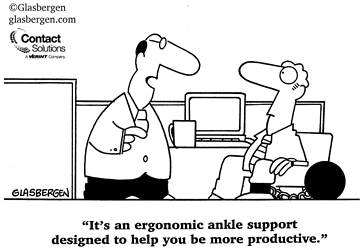 - Forbes: Employee Productivity Declining: Who Is To Blame? As you know, too many objectives are on the line to mess up this key contact center KPI. Achieving strong agent productivity results are worth their weight in gold and can help you hit pay dirt with contact center and CX optimization. So let’s look at what clues we can glean from the iconic Monopoly game for well-played or risky agent outcomes. A roll of the dice decides your fate and the fate of other players. A move you make either lands on a good outcome or a bad one – reaping the rewards of the steps you take, or paying the penalty for a misstep. Every roll of the dice in Monopoly either brings you to real estate you can buy and money you can gain, or sets you back and burns a hole in your pocket. The same holds true for your contact center team. When you take a close look at the insights available to you, it’s like pausing to analyze benefits of buy or pass in Monopoly. 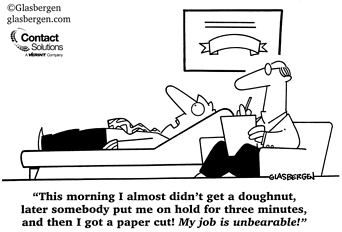 When’s the last time you did a workload analysis? A customer service agent workload analysis can reveal trends and roadblocks affecting agent time that can be avoided. This can include comparing call volumes with IVR call transfers, routine or systematic spikes that can be scheduled to cover, for example. Similarly, how’s your IVR performing? Maximizing the value of self-service can deflect agent workload on tasks that are routine and add little value. Give them more time to spend on the interactions that need them most. 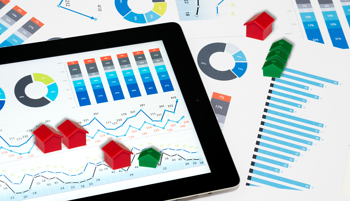 Are you too busy managing daily metrics? Broadening your view of contact center analytics can reveal insights to prevent long-term missteps, save you money and improve CX. This infographic cites examples of how excellent self-service improves agent utilization rates. At some point, you end up paying a tax from your much-treasured cache. The impact of agent productivity losses can go far in your business. Enterprises know that time is money but it’s also retention, loyalty, reputation, revenue – and jobs are on the line. Are your agents happy? It’s not just customers we want happy. Agents who are happy and engaged make your business successful, that’s no secret. What may surprise you are all the areas of your business this can affect. Are you constantly putting out fires? If you spend most of your time keeping the lights on in your contact center you are missing critical opportunities to develop, motivate and optimize the team you’ve invested so much in. This eBook highlights how the cost of employee engagement impacts operations. Players compete to get control of the board by snatching up real estate. You definitely don’t want your agents tripping over themselves and each other to be winners. They all deserve that opportunity. And by the way, so do you. Are your agents set up to succeed? In this omnichannel, highly digital world, requests and data are coming at you from all directions. Don’t lose sight of your opportunity to benefit from lower-cost customer service channels and from a more integrated view into your customer service analytics. Do you have time to put a thinking cap on? As the contact center leader, if you don’t have time to analyze and strategize then your whole contact center game weakens. Your own time for development will drive better agent productivity. That’s like you grabbing up prime real estate to protect your future plays. Chance or Community Chest direct players to follow new rules. There’s no such thing as a three-dollar bill, and there’s no time or budget for surprises. Just like landing on Chance for Community Chest spaces on the Monopoly game board, issues will come up that will require you to rethink your agent processes and your strategy. Can you keep the wolves at bay? Consider your ability to access and analyze real-time insights into routine interactions and unusual activity. Compare results across channels for early warning signs and actionable solutions that keep your agents productive and your customers happy. Do you consistently meet SLAs and other critical metrics? If your agent numbers are consistently on track with no room for improvement you must feel like a million bucks. But that’s pretty rare for demanding contact center operations, and metrics can be up for chance and cost you a pretty penny. Most likely there are lower cost and less resource-intensive technologies and process improvements on the table you can leverage. Getting sent to jail blocks your chance of getting any benefits. Most likely you don’t have any “get out of jail free” cards in your pocket. Unlike the famous saying “what happens in Vegas stays in Vegas,” what happens in your contact center affects a broad range of business results. You can’t roll the dice and then just cut your losses. If you want to move forward in your agent productivity goals, you need to be able to handle roadblocks along the way. Do you experience CX challenges? Many CX issues can be solved by improving customer access to voice self-service, providing better personalization and predicting what your customers need. Self-service channels like the IVR act as your “get out of jail free” card, because it can accomplish all that for you at a lower cost and with strong customer preference, while reducing agent workload and operational stress. Do you face last-minute, urgent demands from the top? You are constantly asked how your KPIs are doing, if you are meeting SLAs and if you are budget. When ad hoc requests come down from above or you are challenged on a KPI, you need a clear understanding of the intelligence your contact center technology provides to prove you’re making the right decisions. Playing the game can either stress you out or pump you up. There’s a lot of stress involved in making sure your contact center is optimally run and your agents are productive and happy. Imagine how these issues make your agents feel. Outcomes can be phenomenal for you both to put you on a winning streak, or the opposite could be true. How are your agent retention rates? If you are constantly trying to keep butts in seats, there are many factors you consider, such as workload, priorities, training, development, recognition and more. When you monitor and improve customer engagement at the front of your contact center in the IVR, you can alleviate some of that stress. When you simultaneously leverage your workforce optimization (WFO) tools to complete the picture, you get better odds on that winning streak. How are your customer retention rates? Let’s not discount the value of the customer experience. When customers are satisfied and happy they don’t project that stress onto your agents. In fact your agents may never talk to them because they probably self-serve their needs without having to back-up your agent queue and call wait-times. It’s equally important to achieve positive results from both customers and agents to pump up your results and optimize your agents. 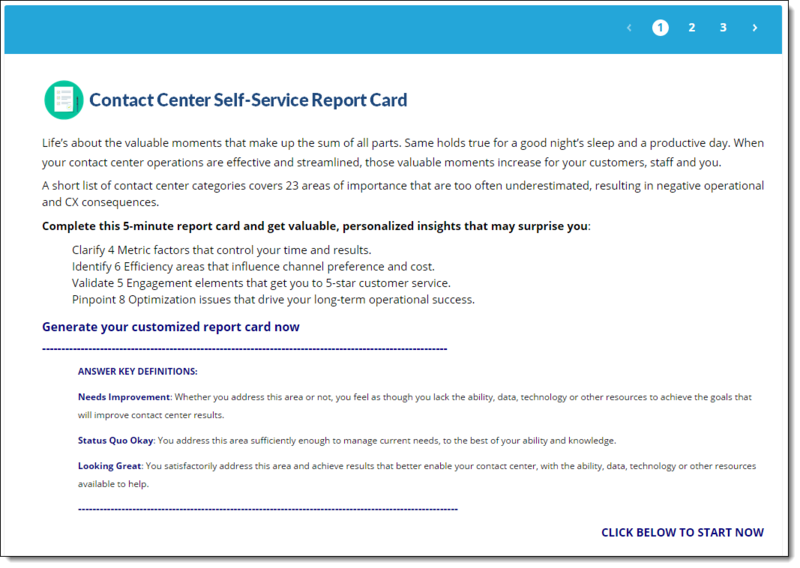 Take 5 minutes, answer some questions about your performance and priorities, and get your Customized Contact Center Self-Service Report Card. Take 5 minutes, answer 4 questions and get your customized report card.